Curious behavior of the Brother MFC-8890 | Awaisi, Inc. The brother multifunction copier printer fax scanner is a popular printer for small businesses and large departments. It has a curious behavior. 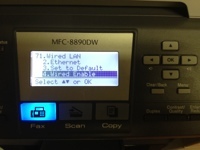 If for some reason the wired network connection has been lost due to power outage or network re-wiring, the printer will turn off it’s internal Ethernet connection. Simply unplugging and replugging the Ethernet cable will not be enough. 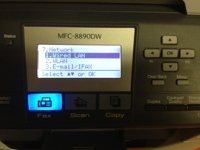 On the printer, you go to menu –> network. Press ok and press ok again for “Wired LAN”. Work your way down to “Wired Enable” and press ok. Set to “On” and press ok. 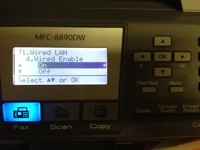 Your printer should be live on the network again.